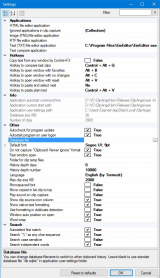 ClipAngel is a comprehensive and reliable application which is able to capture several clipboard objects and lets you select any item and paste it in any other program. The program offers increased compatibility and flexibility, allowing you to easily manage and handle all your clips. ClipAngel includes support for several clipboard formats, including HTML, TXT, image, RTF, file, etc. The application also lets you see the source URL for your HTML clips. In addition, the utility lets you filter your clips by their type, or by masks. Keyboard shortcuts are supported. ClipAngel will store the recently used text filters. The application marks the used clips and the filter matches in your text. Hyperlinks can be marked and opened, as well. Moreover, the utility will mark the END of your clip text and the filter matches in the list. The original text or the selected plain text can be pasted to other programs with a single mouse click. ClipAngel allows you to move and delete clips in your list. The program will keep a history of all the used clips and allows you to mark your favorite clips. The history will be preserved even if the system crashes. The application supports Drag&Drop operations. The program supports a vast array of clipboard formats. The application offers preview for image clips. ClipAngel has been tested by Download82.com team against viruses, spyware, adware, trojan, backdoors and was found to be 100% clean. Our editors will recheck this software periodically to assure that it remains clean.